Oktoberfest in Munich is the world’s largest folk festival and two weeks of non-stop beer-drinking, sausage-eating, lederhosen-wearing, and merry-making. 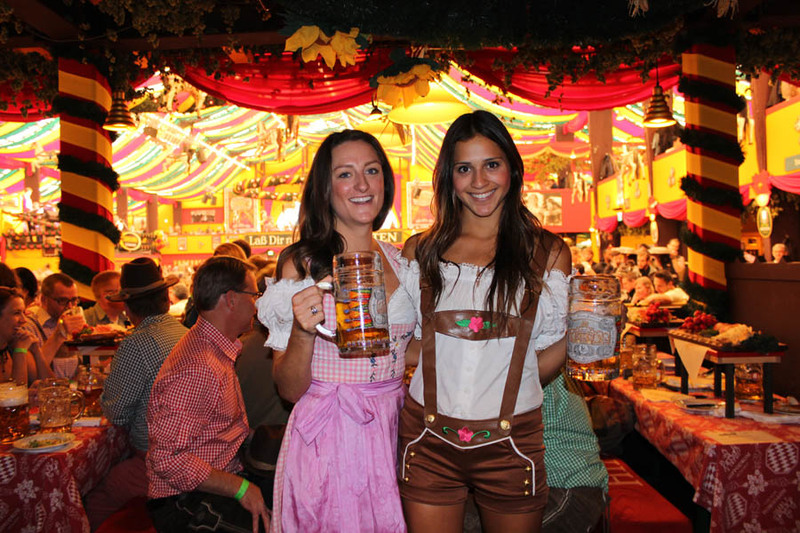 Traveling to Munich to celebrate Oktoberfest offers a contagiously fun opportunity to immerse yourself in Bavarian culture — traditional costumes and all! 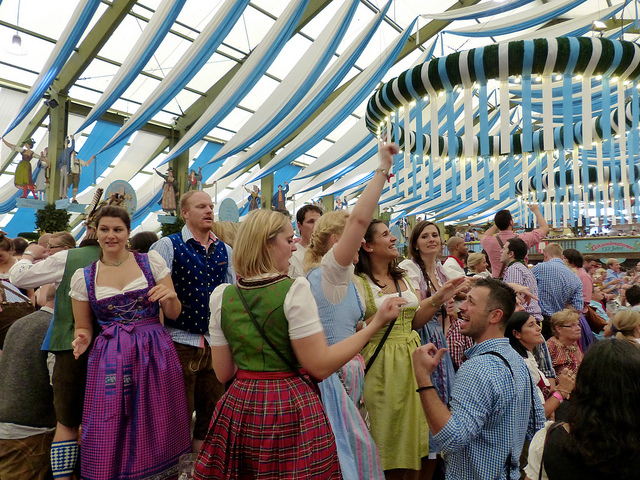 But if you’re going to look the part, eat the part, and drink the part of a Bavarian reveler, why not learn a few useful German phrases so that you can sound the part as well? Monolingual American travelers to Germany can back away from their Rosetta Stone software. Many Germans speak English, and speak it well enough to hold an extended conversation. In 2016, Germany ranked 9th globally among non-native English proficiency. English language is part of the core-curriculum in German public schools from grade five all the way through high school graduation. Furthermore, many German university students complete a significant portion of their coursework in English. And because English competency is seen by employers as a valuable skill, many Germans pursue extra-curricular means of improving their English. As a rule of thumb, you can more or less assume that anyone between the ages of 18 and 50 who you encounter in a large city like Munich will be able to hold at least a basic conversation with you in English. There are, of course, exceptions, and it is always polite to address people in German first. 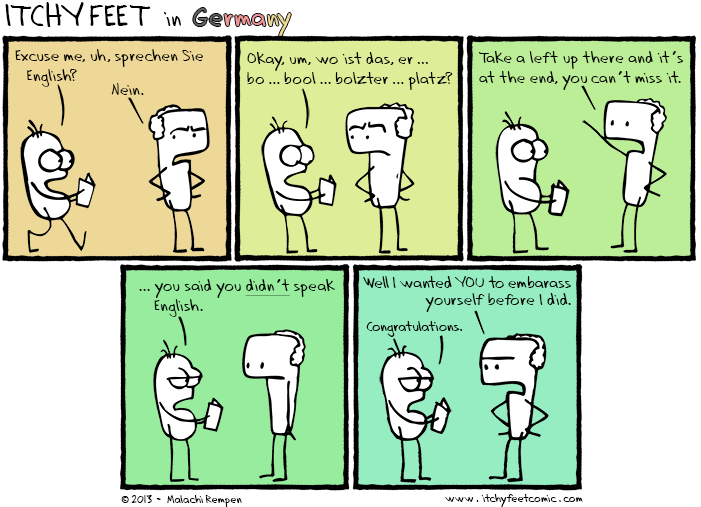 But more often than not, you can expect to be impressed by the general level of English fluency in Germany. If you are headed to Munich for Oktoberfest, you should know that the German you will encounter there isn’t standard German. Instead, you will hear a lot of Bavarian German. There are many related languages spoken in Germany. Many geographical regions have their own unique dialect of German. These dialects can range from almost completely unintelligible for outsiders (even for other German native speakers!) to something of a quirky, colorful variation of standard German. Bavarian, a dialect widely spoken in Munich and much of southeastern Germany, leans towards the former category. For reference, imagine the difference between American English and Scottish English. Map of the nine most prominent German regional dialects. Source: The Economist. Bavarian German is still technically German, but it sounds very, very different from Standard German. The Bavarian dialect swallows up many consonants and vowel sounds, simplifies several grammatical features, and uses completely different words from those which are common in the rest of the German-speaking world. Many non-Bavarian Germans find the Bavarian dialect to be mumbling and bucolic. On the more positive side, Bavarian German is also considered to have a friendly and laid-back sound. It’s really hard to sound stuck-up when you’re speaking Bavarian! If you’re worried about communication in Munich, don’t be. Not only are a majority of Bavarians perfectly capable of understanding and speaking Standard German, but the rate of English fluency in Bavaria is also very high. Especially in cosmopolitan Munich, you won’t have any issue getting around with English and a few useful German phrases. If there is one German phrase you learn during your time at Oktoberfest, let it be this one! Prost is a cheer that works for any social drinking occasion, and is easy enough for Americans to pronounce. But there is more to cheersing than simply this word. Germans tend to make sure they clink glasses with each individual in the group and to make eye contact as they do so – even if it requires a bit of an awkward reach across the table. Even if someone assists you in perfectly fluent English, learning these four German words will really go a long way in expressing gratitude and appreciation. 6. Wie kommt man zur [Wiesn / Toilette / Kasse]? = How do you get to the [festival grounds / bathroom / check out]? 7. Ist dieser Platz frei? = Is this seat free? 8. Wie viel kostet das? = How much does this cost? 9. Sprechen Sie Englisch? = Do you speak English? Wiesn is how Munich locals refer to the Theresienwiese, the large open park-space where Oktoberfest is held. On official maps, you will usually see the full, proper name. But on the street, you will almost certainly only hear it called die Wiesn. 10. Noch ein Bier, bitte! = Another beer, please! 11. Oans, zwoa, drei, g’suffa! = One, two, three… drink! 12. O’zapft is! = It’s tapped! These are three German phrases you will undoubtedly hear a lot of at Oktoberfest, and often shouted joyfully. 11 and 12 are distinctly Bavarian, and are generally great ways to show your enthusiasm. O’zapft is, in particular, is the most iconic of Oktoberfest sayings. This is the cry you will here once the Mayor of Munich has tapped the ceremonial keg, thus kicking off the entire two-week-long event. 14. Woher kommst du? = Where are you from? 15. Ich lade euch ein. = This round is on me. 16. Du hast eine super geile Lederhose an. = Your leather pants are really cool. Need to compliment a woman on her traditional Bavarian outfit instead of a man? Swap out “eine super geile Lederhose” for “ein super geiles Dirndl” and you are good to go. 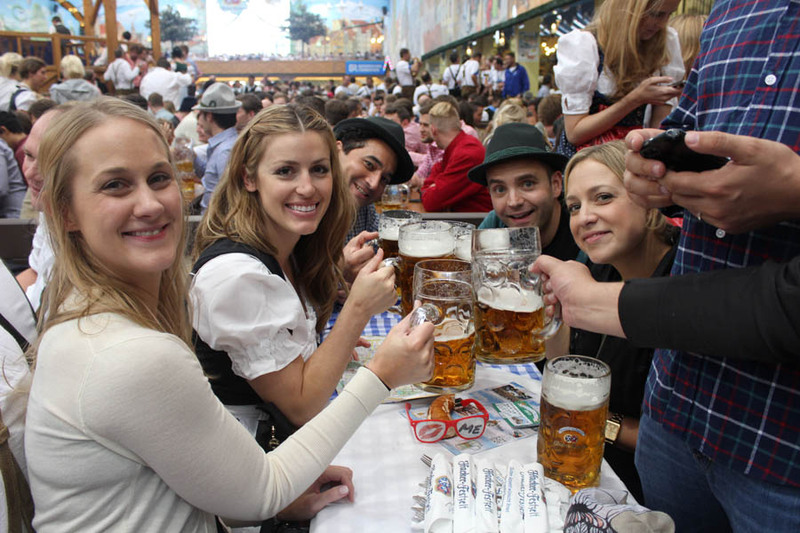 Ready to try out these German phrases at Oktoberfest in Munich? 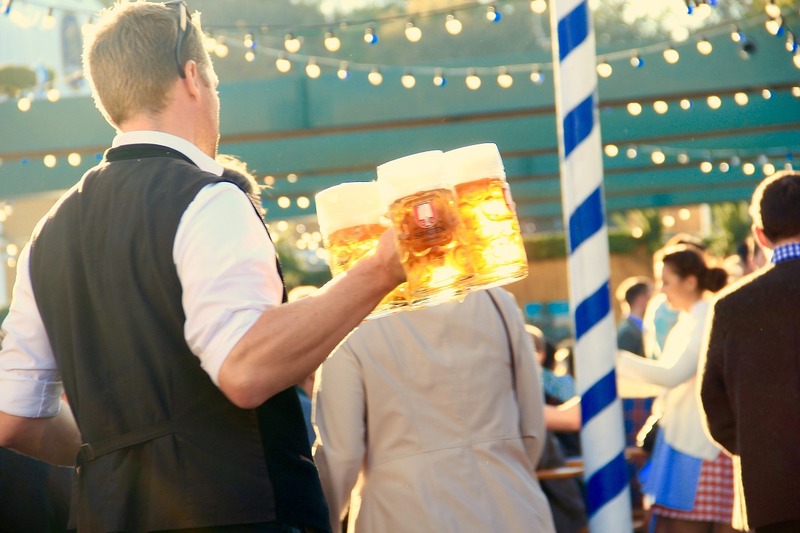 Browse our selection of Oktoberfest travel packages, complete with exclusive beer tent reservations and awesome hotel bookings.